Mary Cassatt is most famous for her paintings of mothers and babies, and that's what first attracts "Claire" because she has a new baby sister. But through research for her class report Claire learns many surprising facts about Mary: she was an American who lived in France nearly all her life, she never married or had children herself, and she became a professional artist at a time when respectable ladies simply did not do that! 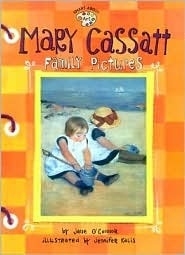 With beautiful reproductions of Mary Cassatt's best-loved paintings as well as lively childlike pictures that illustrate her life, this Smart About Art book gives children a wonderful "portrait" of a great artist and fascinating woman.